Yesterday, the US Department of Justice sued Apple and six publishers, alleging that they had conspired to fix prices. It all centres around the switch from a wholesale model of selling e-books from the publishers to retailers (such as Amazon) to using the agency model of selling books that Apple and the publishers agreed to adopt in early 2010. Some of the publishers have already settled with the DOJ, but other publishers and Apple have vowed to fight the allegations. But what is the agency model and how does it work? I've done my best to explain the two systems and some of the details surrounding the model that was adopted by Apple and the publishers that are in hot contention. I've also summarised the DOJ's allegations as well as their timeline of events that the DOJ goes into great detail in their court filing. Finally, if you find yourself fascinated by the topic, at the end of the post is a further reading section to get more details and some opinions on the issue. Jump the break to view the full article and video explaining the wholesale and agency models. Traditionally books were sold using a wholesale model. Publishers would set a Recommended Retail Price (RRP) and then sell those books to retailers at roughly half the price of that RRP; that price that the wholesaler sells the book to the retailer at would be called the wholesale price. Retailers would then sell the books at whatever price they wanted to -- traditionally it would be around the RRP, but if they wanted to, they were free to offer those books at a price less than the wholesale price — meaning the retailer would be losing money on the sale of that product. As publishers began selling e-books, they retained this wholesale method. So when retailers such as Amazon wanted to sell e-books they established wholesale contracts with the publishers. But Amazon, as part of their move to promote the Kindle device they sold, began to sell new release and best selling e-books at $9.99. This price was below the wholesale price. Amazon was relentless in their push for $9.99 prices on virtually all new release and best seller titles. The publishers were still getting the full wholesale price, but customers were getting e-books for less than that price and Amazon was willing to take a loss on them. Amazon made those e-books a loss-leader, meaning that they priced them at below cost-price in order to entice new customers to purchase a Kindle or perhaps even to encourage them to purchase other goods from Amazon. A common example used to illustrate the idea of a loss-leader is that of the razor/blades example. Frequently the razor will be sold at a loss, but profit will be made as people purchase the blades. When Apple launched the iBookstore it signed contracts with the big publishers to use the agency model, rather than the wholesale business model. The formation and some of the details of the agency model between Apple and the publishers is what is in contention with the DOJ. 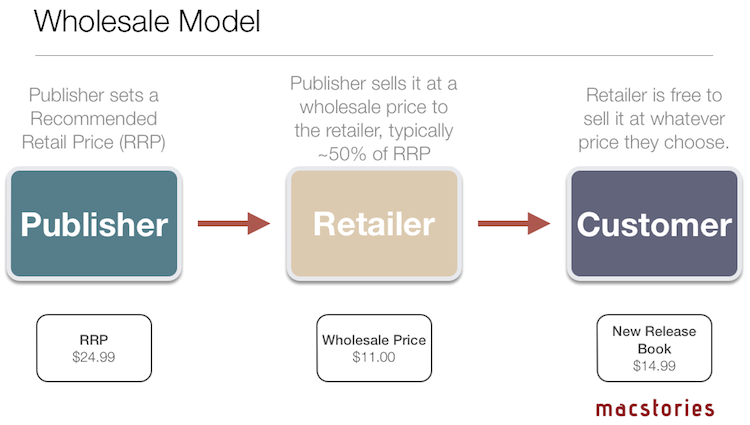 Under an agency model the publishers take control of retail pricing. The retailers (such as Amazon) simply become agents through which consumers can purchase an e-book. The retailers lose the ability to charge customers a different price. Under the agency model that Apple got the publishers to agree to, 70% of the price would go to the publishers, whilst Apple would get 30%. There was one other important aspect to the agency model that Apple established with the publishers -- it included a most-favored-nation (MFN) clause. An MFN provision will frequently appear in contracts between wholesalers and retailers and it ensures that the wholesaler will provide the retailer with the best wholesale price. But Apple adopted it in the agency model to require that the publishers adjust e-book prices in the iBookstore to match the lowest price offered by any other retailer -- regardless of whether the publisher controlled the pricing in that retailer. This meant that the iBookstore would always have the e-book at the cheapest price. It also meant that if a retailer was offering the book for a cheaper price, the publisher would have to lower the retail price to match it. If that meant the price was below what it cost to produce, the publisher would take the loss, not Apple -- they would still get their 30% cut. The traditional purpose of MFNs are used to protect a retailer's ability to compete, ensuring that they aren't disadvantaged by the wholesaler giving their competitors a better deal. The DOJ contends that the way this MFN works, it was designed to "protect Apple from having to compete on price at all, while still maintaining Apple's 30 percent margin." Those are strong words, but there is certainly a kernel of truth to that. To put it in the most simplistic sense, the DOJ is alleging that Apple and the publishers colluded to raise the prices of e-books by switching to the agency model where retail price competition would cease. More specifically, it alleges that not only did the various publisher executives meet to discuss issues of prices and the Amazon "problem", but that when Apple negotiated with the publishers to adopt the agency model, Apple acted as a go-between to confirm to each of the publishers that the other publishers were signing up to the same agreement. They allege that the change to the agency model "would not have occurred without the conspiracy among the defendants". The DOJ contends that the direct result of this collusion to adopt an agency model is that retailers have lost their ability to compete on price. Further, they allege that the collusion meant that once publishers had control over prices, they limited retail price competition amongst themselves as well. Consequently, the DOJ estimates that "millions of e-books that would have sold at $9.99 or for other low prices instead sold for...$12.99 or $14.99". You can view the Department of Justice's full court filing, which includes a 30-page plus timeline of events. I have summarised the key points that the DOJ makes below. Please note that some things are omitted in my version, including some context for events in order to shorten it to a reasonable length. I do encourage you to read the full document if you have the time and are interested in the issue, as it's laid out in clear English and also includes the DOJ commentary on various events. Beginning (at the latest) in September 2008, the publisher's senior executives "engaged in a series of meetings, telephone conversations...in which they jointly acknowledged to each other the threat posed by Amazon's pricing strategy and the need to work collectively to end that strategy". This included meetings once per quarter in which the group of CEOs discussed "confidential business and competitive matters, including Amazon's e-book retailing practices". Penguin Group's CEO John Makinson met privately with other publisher CEOs on June 16th, 2009 and September 10th, 2009. Discussion surrounded on the growth of e-books and complaining about Amazon's role in that growth. In 2009 at the latest, the five publishers (named in the allegation by the DOJ) had agreed to act collectively to "raise retail prices for the most popular e-books above $9.99". One CEO wrote to his corporate superior that "...the top publishers are in discussions to create an alternative platform to Amazon for e-books. The goal is less to compete with Amazon as to force it to accept a price level higher than 9.99... I am in NY this week to promote these ideas and the movement is positive [with the other four publishers]". Competition for the attention of readers will be most intense from digital companies whose objective may be to disinter mediate traditional publishers altogether. This is not a new threat but war do appear to be on a collision course with Amazon, and possibly Google as well. It will not be possible for any individual publisher to mount an effective response, because of both the resources necessary and the risk of retribution, so the industry needs to develop a common strategy. This is the context for the development of Project Z initiatives [joint ventures] in London and New York." "our goal is to force Amazon to return to acceptable sales prices through the establishment of agency contracts in the USA... To succeed our colleagues must know that we entered the fray and follow us"
"at this point, it would be very easy for us to compete and I think trounce Amazon by opening up our own e-book store"
Curiously, the DOJ suggests that Apple also considered that they could divide the digital content world with Amazon, allowing "each to "own the category" of its choice - audio/video to Apple and e-books to Amazon". Soon after that email, Apple concluded that because of competition from other retailers (notably Amazon) they wouldn't be able to earn its "desired 30 percent margins on e-book sales". On December 8th 2009, Eddy Cue telephoned each publisher to schedule exploratory meetings on December 15 and 16. The DOJ suggests that Hachette and HarperCollins took the lead in working with Apple and that they "communicated with each other about moving to an agency model" in between those meetings and Cue's first call. At the exploratory meeting, the executives of Hachette and HarperCollins told Cue that they wanted to sell e-books under an agency model. Other publishers stated that "they "certainly" did not want to continue "the existing way that they were doing business", i.e. with Amazon promoting their most popular e-books for $9.99 under a wholesale model". A second round of meetings began on December 21st, 2009. By then the agency model was the focus of discussions. 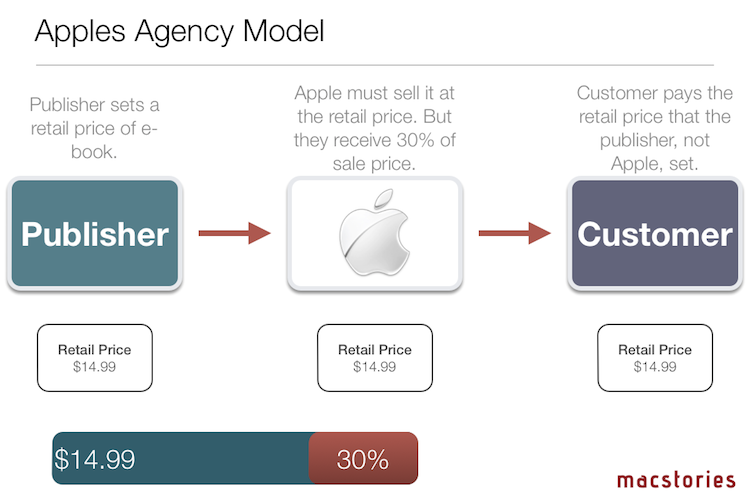 At this point, Apple "proposed that publishers require all retailers of their e-books to accept the agency model". Cue emailed Jobs reporting that the publishers saw the "plus" of Apple's position as "solv[ing the] Amazon problem". He also noted that Apple's proposed maximum price for newly released and popular books was too low at $12.99 for the publishers. With their significant leverage over publishers, Apple negotiated a 30% commission, much larger than existing margins in the industry. As negotiations continued through to January, Apple kept each publisher informed of the status of negotiations with the other publishers. It also assured them all that the proposals were the same, and agreed no publisher deal would be materially different to another. The DOJ comments that "Apple thus knowingly served as a critical conspiracy participant by allowing the publisher Defendants to signal to one another both (a) which agency terms would comprise an acceptable means of achieving their ultimate goal of raising and stabilising e-book prices, and (b) that they could lock themselves into this particular means of collectively achieving that goal by all signing their Apple Agency Agreement". 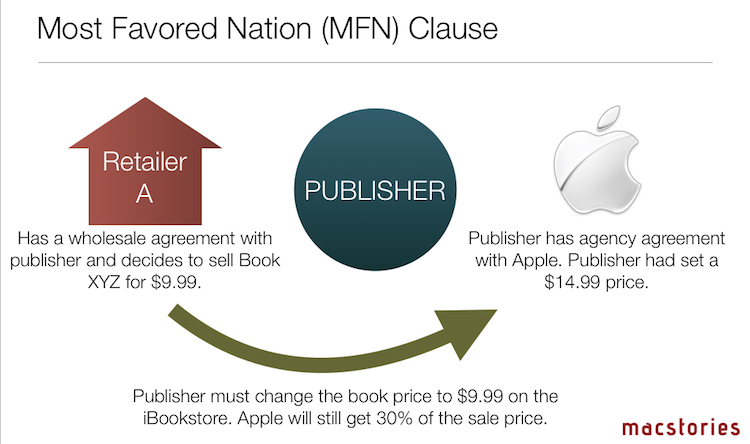 On January 11th, Apple emailed its proposed e-book distribution agreement to the publishers, including the MFN clause. Some publishers initially suggested it wasn't required, but in the end they all agreed to the MFN mechanism. On January 16th, Cue offered revised terms that added new maximum pricing tiers that increased permissible e-book prices to $16.99 and $19.99, depending on the book's hardcover price. The publishers were all very concerned that they would be the only ones to sign the agreement, but Apple provided the "needed assurances". To persuade one of the publishers to stay with the others and sign, Jobs sent an email to an executive of the parent company, saying they had two choices (i) accept the status quo ("Keep going with Amazon at $9.99") or (ii) continue with a losing policy of delaying the release of electronic versions of new titles ("Hold back your books from Amazon"). "According to Jobs, the Apple deal offered the publishers a superior alternative path to the higher retail e-book prices they sought: "Throw in with Apple and see if we can all make a go of this to create a real mainstream e-books market at $12.99 and $14.99."" Between December and January of 2009/2010, communications between the executives increased significantly, placing at least 56 calls to each other. The DOJ alleges this was all to "exchange assurances of common strategies and business plans regarding the Apple Agency Agreements". On January 24th, Cue met with one publisher with the intention of finding out whether they would sign the agreement. Less than an hour later the CEO made two phone calls to other publisher CEOs. The CEO admitted under oath to placing them specifically to learn if the other two publishers would sign with Apple. On January 24th and the following two days, all five publishers signed the agreement. All agreements came into effect on April 3, 2010 -- the release of the original iPad. A February 10th presentation by a publisher stated "The Apple agency model deal means that we will have to shift to an agency model with Amazon which [will] strengthen our control over pricing." Within four months of signing the agreement, "Macmillan presented Amazon a choice: adopt the agency mode or lose the ability to sell e-book versions of new hardcover titles for the first seven months of their release." Amazon rejected it and briefly stopped selling all Macmillan books. But when it realised that all five publishers would sooner or later give them the same ultimatum, Amazon backed down. When a large print book and e-book retailer marketed books from a publisher who hadn't adopted the agency model, Penguin CEO David Shanks encouraged them to to punish that publisher. He said in a June 22nd email that he was "baffled" why the continued to support because they hadn't adopted the agency model which was beneficial to brick-and-mortar stores. 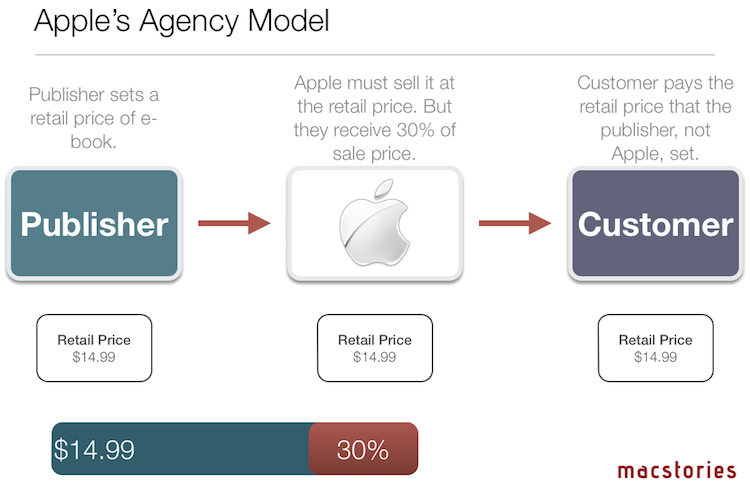 Apple also pushed the publisher to adopt the agency model over the summer of 2010, with Apple flatly refusing to sell their books unless they adopted the agency model.